As I was driving in to work today I heard ESPN’s Mike & Mike talking about whether or Kansas City Chiefs running back, Jamaal Charles, should have asked for Peyton Manning’s autograph after their game Sunday. I don’t know what everyone is freaking out about over him asking for an autograph. It’s not like he said he’d have to rent a car if he ever went to New Orleans so he could drive by where Peyton went to high school, where Archie and Olivia live or where Cooper works, because that would just be weird. Oh wait, Tammy said all of that. 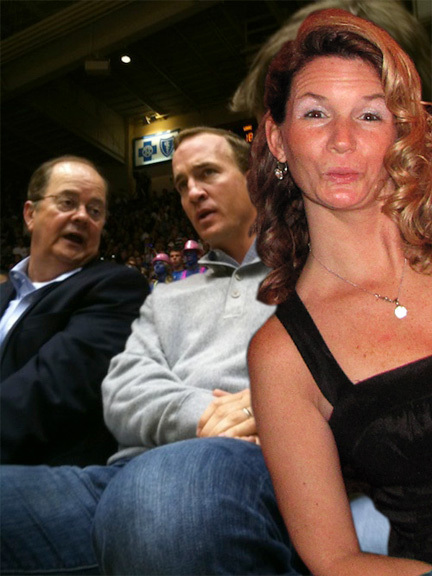 Tammy would pay to sit this close to Peyton. When I recently reminded Tammy that I once stood beside Peyton, on the field in Memphis after Tennessee played Ole Miss in the mid-90s, she made sure I knew how big of a role that played in our relationship. Tammy: I know. Why do you think I married you? Tammy: Dang, you can get that close to him? Tammy: I’d pay to see him. You know, to like get a front row seat for something. 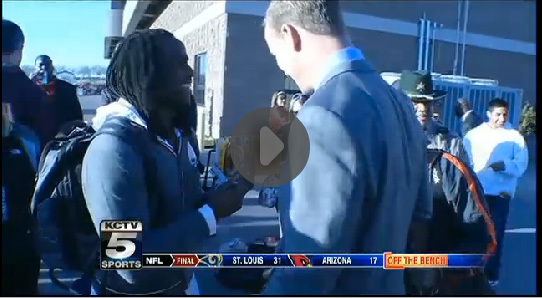 So no, I don’t really think Jamaal Charles asking Peyton for an autograph is that big of a deal. 2 Responses to What’s the Big Deal? Tammy’s hair is gorgeous. If I were Peyton, I’d be like, “It’s free” and start playing with her hair. Sorry if that is creepy, but no I am not. At least you know where you stand in the grand scheme of things. Perhaps it helps that Peyton has no moustache.